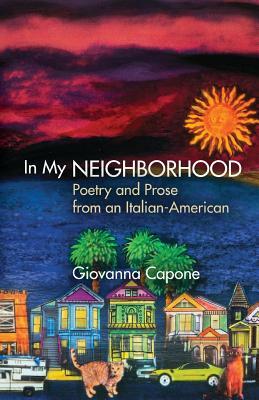 In My Neighborhood is a lyrical, humorous, and provocative book documenting Giovanna Capone’s search for a political and personal identity as an Italian-American raised in an old world traditional family, who later claims herself as a lesbian and a political activist. From beginning to end, through poetry, essay, and memoir, she explores her journey both emotionally and geographically, as she leaves the hub of her ethnic identity in New York, and enters the world beyond her childhood. Her writing is bound by a search for love, freedom, and ethnic identity, and also by her feminist politics and point of view. Her beloved heritage is an ever-present touchstone as she examines her roots and describes her adult life and developing consciousness. Giovanna Capone is a poet, fiction writer, and playwright. She was raised in an Italian American neighborhood in New York. Her work has appeared in "Curaggia: Writing by Women of Italian Descent," "Bless Me Father: Stories of Catholic Childhood," "Unsettling America: An Anthology of Contemporary Multicultural Poetry," "Avanti Popolo: Italian-American Writers Sail Beyond Columbus," "Queer View Mirror 2," " Lesbian & Gay Short Short Fiction," and "Fuori: Essays by Italian/American Lesbians and Gays," and "The Paterson Literary Review." She lives in the San Francisco Bay Area, where she works as a public librarian.